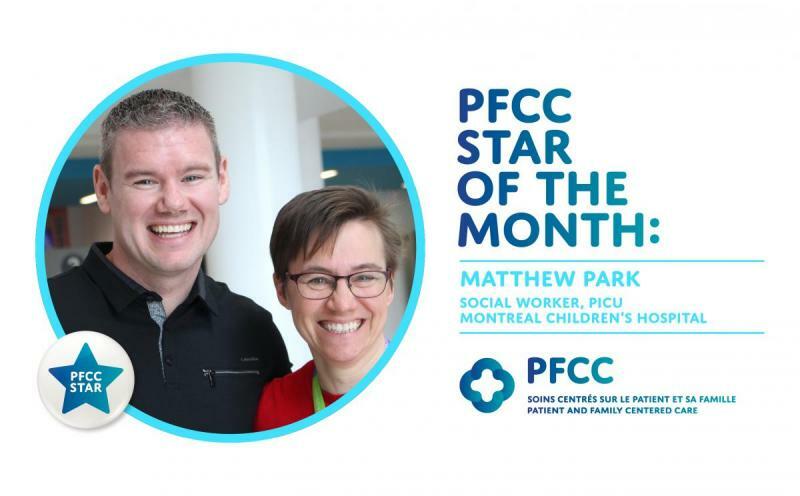 Before studying social work, Matthew worked with adults and teens in the community but once back at university for his social work degree, he decided to pursue a career in pediatrics. In his own words, he was “lucky enough” to get a stage at the Montreal Children’s Hospital which eventually led to a full-time position. In 2008, he joined the hospital’s PICU team, a group which strongly share his views. “My colleagues all have a similar vision in terms of wanting to integrate families but also partner with them with respect to their child’s care,” he says. Matthew works closely with colleagues from Psychology, Spiritual Support, Child Life, and nursing/medical teams to determine how they can best help each family. Matthew provides counselling to families as well as helping them understand and navigate the services and benefits available to them. Often, families in the PICU must stay for lengthy periods. “I consider it a privilege to accompany a family in such a difficult situation, to offer them both emotional support and help them with everything in their lives that continues on outside the hospital doors,” he says. He also acknowledges that while a family’s journey in the PICU can be one of the most difficult times of their lives, there are many positive things that can happen as well.